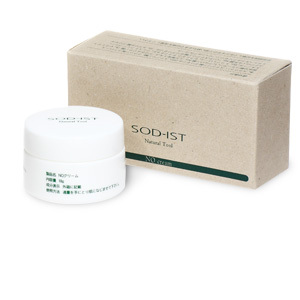 SOD-IST NO Cream contains a rich combination of natural ingredients and is very gentle to the skin. It contains yuzu fruit extract which cures dryness and roughness, and helps the skin recapture its natural freshness and clarity. Moreover, ceramide, a moisturizing component, helps retain moisture leaving the skin soft and smooth. SOD-IST NO Cream is fragrance free, contains no coloring additives or preservatives and is safe for sensitive skin. *1 SOD-IST NO Cream is preservative free and therefore cannot be mass produced. It is made-to-order, upon receipt of order. *1 Please discontinue use if any skin irritation develops.